I’ve been a long time lurker on here for a while and decided to finally join as I may now actually have something to contribute. While not exactly new to the hobby having hoped to start my layout a few years back, in the meantime I’ve been acquiring locos and trying to learn as much as I can so when I finally manage to build my layout, I have a reasonable idea on what to expect and how to do it. Now the location of this new layout will be no surprise as you’ll have read the title of the thread. 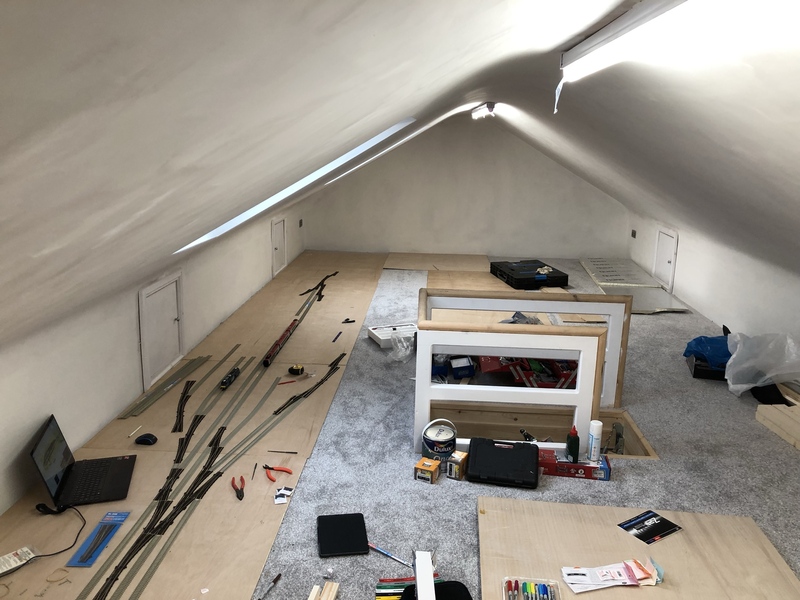 As I type this my loft is being converted to a proper play room, so my dream is now becoming a reality. Dimensions I’ve been reliably informed are 8.5m x 4m (27’11” x 13’1”) so quite a decent size. Here is a before photo. 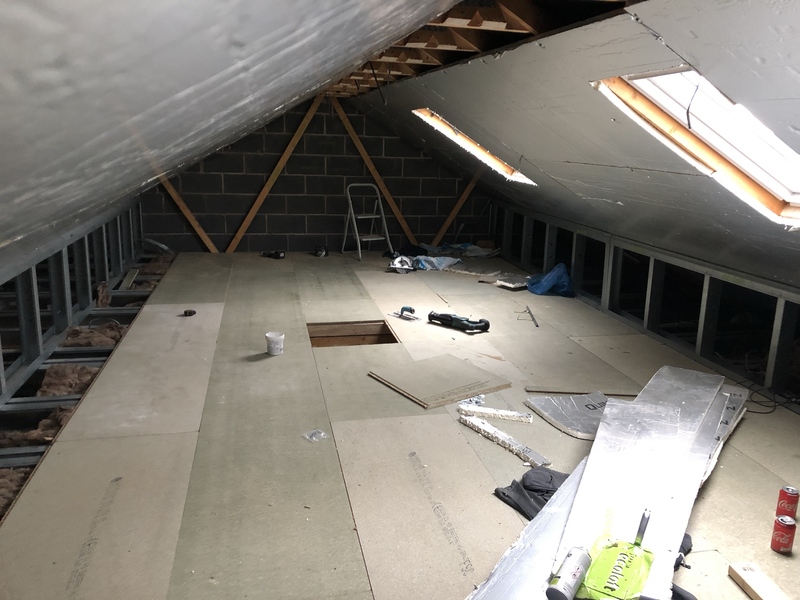 All the trusses will be gone, real floor put in and it’ll be a proper room with the layout at sitting height to maximise the width available due to the shallow pitch of the roof. I’ve been playing with Anyrail to get some semblance of a plan. My brief was basically to have a mainline station, a shunting yard/TMD, replicate my local station (Gathurst near Wigan as it was when it had the narrow gauge railway supplying the local explosives factory). Era is generally modern, but rule 1 applies. The mainline will have OHLE, and also parts of the branch line to fit in with the theme. So my main idea has evolved over several iterations with a bit of input from my friend and colleague, who has his own layout and effectively got me started in railway modelling. This is what I have so far. The top station is based on Wigan North Western (I did also have a Wallgate replica where the island terminus branches off, but I liked the idea of a terminus, so that stayed). Gathurst is at the bottom. Both terminus and TMD are fictional, however I did take inspiration from other layouts I’d seen on here to come up with that plan. With regards to the TMD, I’m still not convinced that it’ll be in that location, but it’s what I’ve come up with so far. The layout is DCC controlled using a Z21 controller. I’m still umming and ahhing over the best way to control the points. I’d like servo control due to the nice slow operation and the compact nature of the servos themselves. Having used solenoids on a little end to end layout I built little over a year ago, I’m not a fan of the clunking when they change. Having looked at a few different systems, I quite like what I’ve seen of the ANE system, although I can’t find much information on it, which is a shame. Does anyone else have this system and can recommend it/put me off or even suggest a system that will match what I’m after. Control-wise, as I’m sure that’s quite an important bit of information, I’m still undecided on whether to have a control panel and use the old fashioned switch method, or just do it through my controller, as the Z21 has a pictorial representation and points control can be as simple as pressing the screen, which I also like. Should one particular system work best and be recommended the most, I’m more than willing to commit to that particular control method. I think that’s about it for now. I always welcome constructive criticism or suggestions on what might work better, which is basically why I’m on here now. There is a vast wealth of experience on here and I’m hoping to learn a lot. Im sure there will be plenty more questions from me as I have lots to learn, but for now, thanks for looking and congratulations for reading this far. Nice 1 Al, big job that the loft conversion, you must of been saving your pennies! 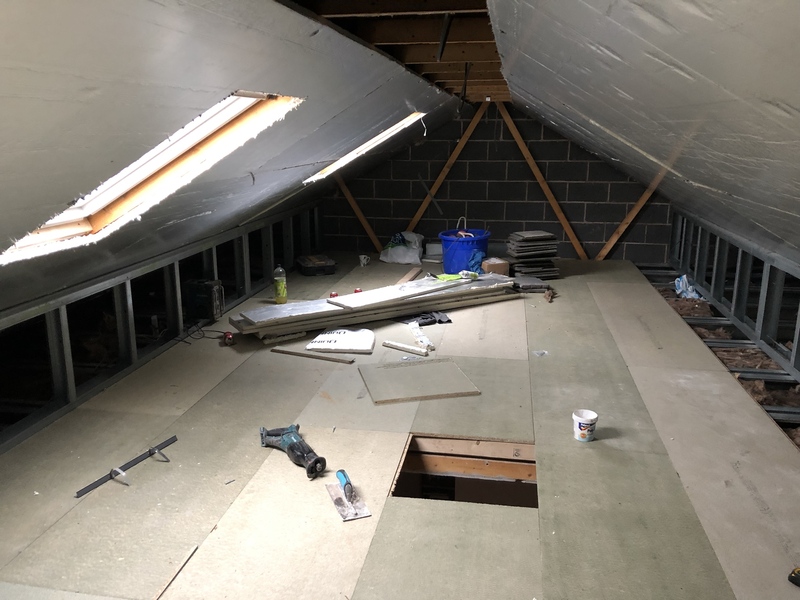 i’ll be following with interest put some photos as the loft conversation progresses rather than a before and after always interesting for us lads in the trade to see how others go about it. Big space you have there to do something with, the plan looks decent, The bottom platforms are not quite right sat on the track are they actually needing to be off set? For a minute looking top right 3rd square down I thought it was two level as I was sure how that intersection of track worked. But looking at the bottom station it is on one level I think. with the TMD I’m assuming it’s the island? I’d suggest you need to make sure you can physically fit up each side of it. At 27ft or 8.5m and 16.5 squares not sure how it scales out. Id add something like “Wigan North Westernish - Modern image” in the Title if I were you it’ll probably draw a few more comments in? Keep us posted very interesting. Good luck with this project. 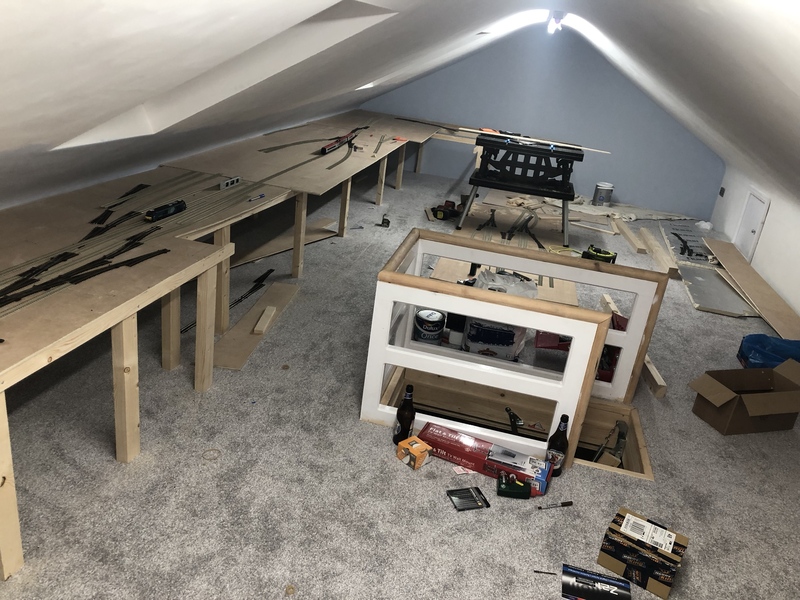 I hope to start my own large attic layout later this year. 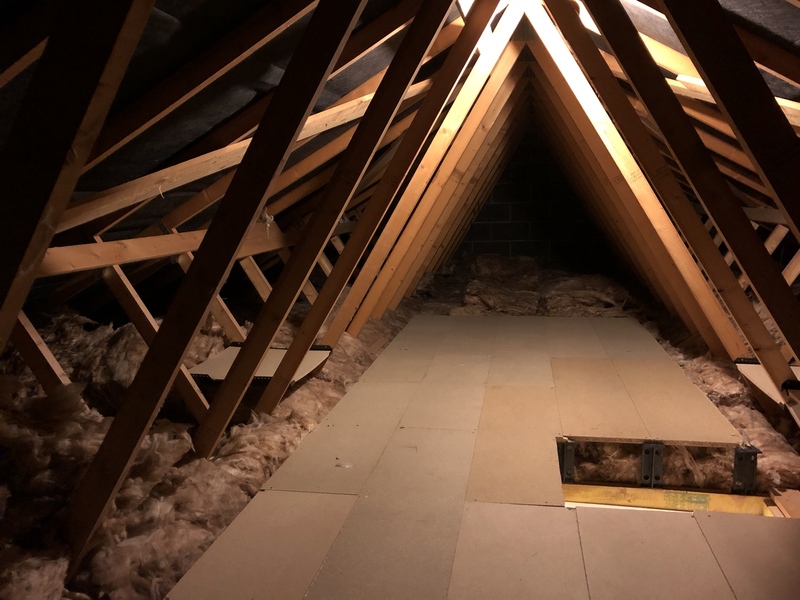 Currently looking for a house with a suitable attic. Thanks for the reply. I’ve changed the topic title now. Only reason I didn’t put a name to it is I’ve not managed to come up with one for the layout yet. But I see what you’re saying, so I’ve had a little update and once I come up with something decent, I’ll put a final title. The builders have been proper grafters, so I’ve not managed to get too many photos as it has progressed, but they assure me they’ve been taking photos, so once I get them, I can put some work in progress shots up. With regards to the plan, it’s always tricky to show elevation on a 2d plan. Top right, the branch line bridges over the top of the main line, starting its incline from the set of points just prior to the top through station. At the bottom, I think somewhere on the curve out of the terminus, the main line will disappear under a bridge and descend under the main layout. This leaves a scenic section for just the branch line while allowing the 4 continuous loops to operate. I hoped to have an ‘underground’ fiddle/storage yard, but immediately underneath each long side are cupboards for loft storage, and above is the roof slope. The ends are fine for ‘unlimited’ elevation as they’re the gables. 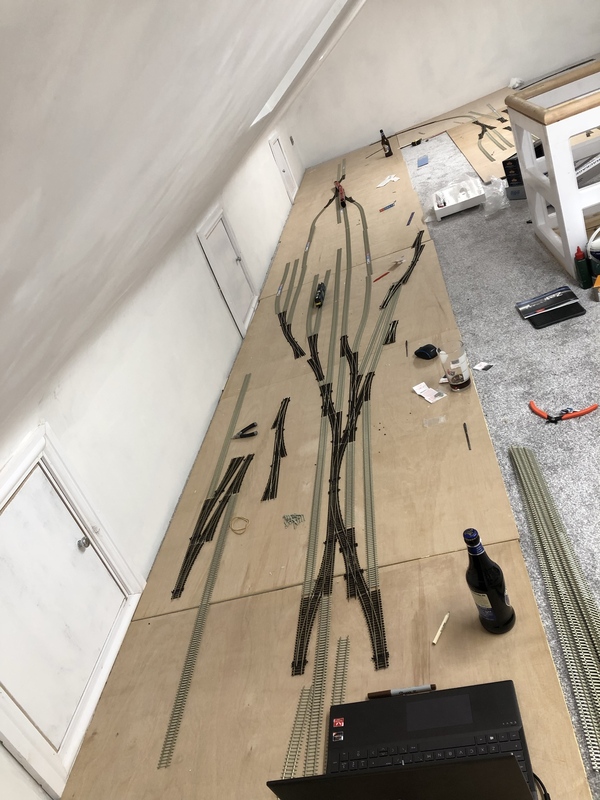 However, obviously they’re not long enough to accommodate not only the slope to and from, but the fiddle yard itself, so I’ll just have to create lots of sidings for ‘on layout’ storage. The TMD is top left, but will probably be a later addition once I’ve got the majority of the layout squared away and I know it’s all working. With regards to scale, the squares I’ve used are 500mm rather than 1ft, as I tend to work in metric. So the widths down the side should be wide enough for me to fit through. 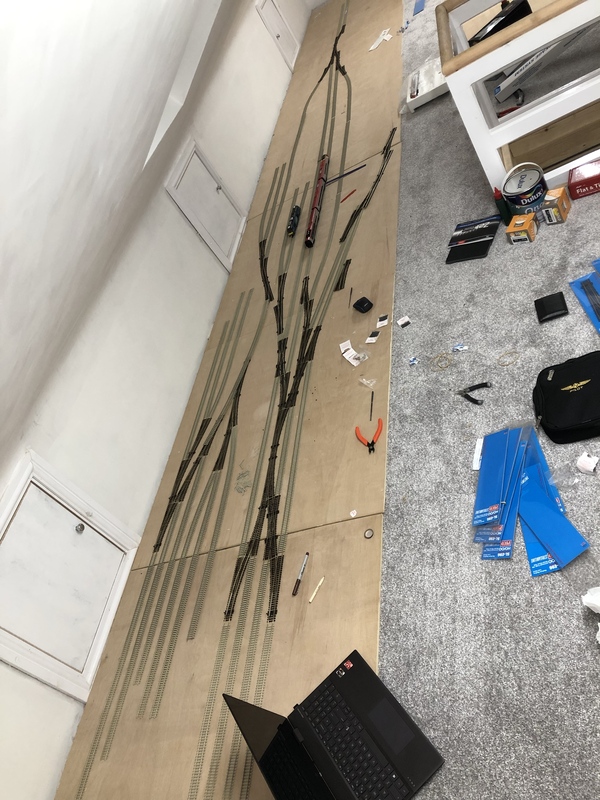 Should I build the baseboards and find it doesn’t quite work, I can always take a circular saw to it before I start laying any track haha. Thanks. I’m looking forward to getting started myself. After work last week, I got a bit excited about getting started and bought a load of track from Hattons on my way home (I work near by), more so I can get an idea of scale and how it’ll work in the real world. It’s great seeing people assess a house with a future layout in mind. I unfortunately had to find and create a space. I remember always looking out for the narrow gauge trains at Gathurst when travelling from Burscough to Wigan whenever my mother dragged us around the shops as a child. The viaduct across the Douglas valley was a spindley looking construction that carried the narrow gauge railway. Ha well there you go most of my assumptions wrong! I’ll try one more 00 gauge? I don’t think you said unless I missed it! Don’t think 0 gauge fits your plan even with 1m wide station area! all photos always well received rest asssured. Ok right next I’m trying to get my head around the elevations of track I think I have it and my first thought was the correct one. But still not certain Guessing yellow is main line and black the branch gathurst station? Complete with narrow gauge shown in thinner black line? Like it a lot mine in the drawing board stage of Barnstaple Town May end up with the narrow gauge upon it one day as the station served the L&B line. Living near Hattons is a bonus, understand what you’re saying about getting a feel for it with some track. keep it coming liking it. Great colour photo’s there Gibbo, full of atmosphere love the narrow gauge there and the viaduct. Intreged by the three sat by the shed apparently having lunch. Thanks for those Gibbo. That’s precisely what I aim to recreate in addition to the surrounding landscape. Unfortunately I can’t find a whole lot of information about that site despite living about 500 yards away from it. It would be nice if I could figure out a way to get the OO9 section to go somewhere too. Perhaps have a mirror image of the original, so it can head off to the left where there is currently not much planned. Then I could put some sort of works in to link the two up. Rest assured all your assumptions in this post are correct. It’ll be OO scale with the dark blue line being branch line and yellow being main line. Same with the OO9 next to Gathurst. As I said above, still not sure where to go with that section. I forgot to post some photos of how it looks as we stand now. Obviously this week it should get finished and Thursday week after the dreaded carpet monster is being fitted. 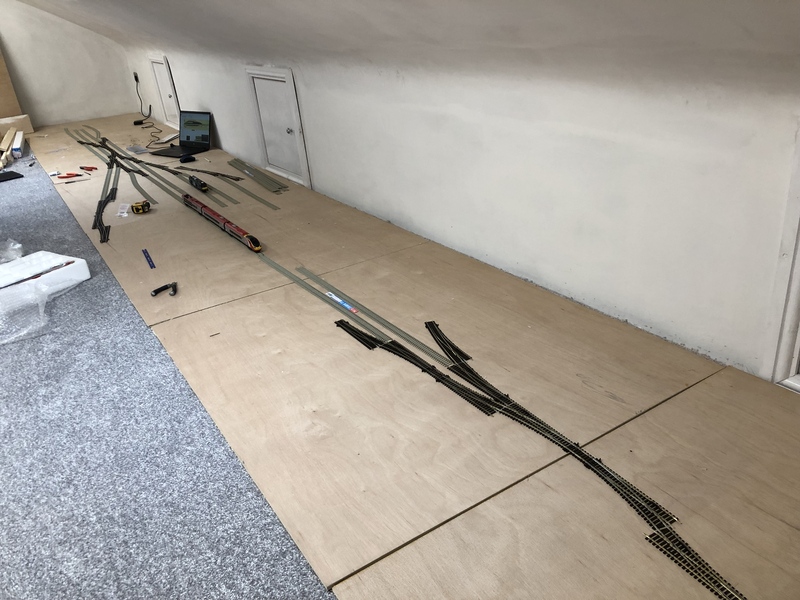 In the meantime, I’ll use the hard floor as a baseboard to get an idea for how it’ll look (at least the top section, which I’ve now got the track for). just because of the shallow pitch of the roof and limiting head height, this will be at a sitting height. So basically at the top of the cupboards shown by the ladder type affair on each side. Do you have a thread for Bannstaple Town? I’ll have to give it a follow if/when you do. Living near Hattons is both a blessing and a curse. It’s not so much a model shop than a model warehouse, where it helps to know exactly what you want when you go rather than browse and come away with way more than you expected to as with regular model shops. As always. Thanks for looking. Comments and suggestions always appreciated. I’m also doing Wigan NW and Wallgate but in N Gauge. My local station was Westhoughton but as it has very limited interest and services I decided not to bother modellng it. I’m doing the mainline as a roundy roundy and the lines through Wallgate as end to end. I’m also using a Z21 Black and have chosen Tortoise point motors for slow blade motion. I found that removing the spring from Peco points helps the point motors work better but I have to have polarity switching as I can’t rely on blade contact any longer. Pictures and stuff are on the N Gauge forum. I got tired of trying to keep two websites up to date with my old layout. Love the track plan and the decent sized loft. Also a nice change to see a terminus station popping out as well maximising operational interest and use of the space. 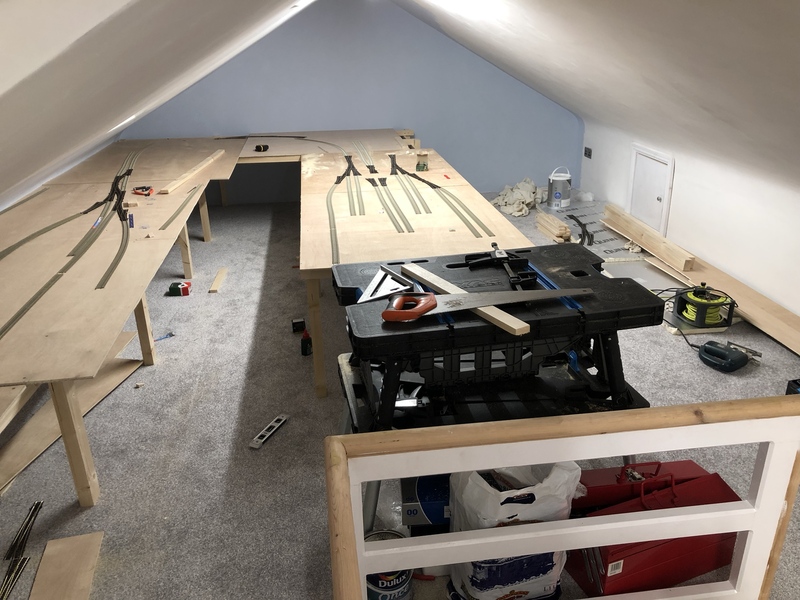 Certainly going to be following this with interest as I'll hopefully get my attic in a fit state for a layout this year. Hi Al love the conversion pics, fair bit of steel going in there by the look of it. Yes a link to my future layout in my signature. I said Barnstaple Town but the working title is Barnstaple Quay Which was actually a Station along the Quay a bit before Town was built. Not a lot to see yet. Thats enough of hogging your topic! 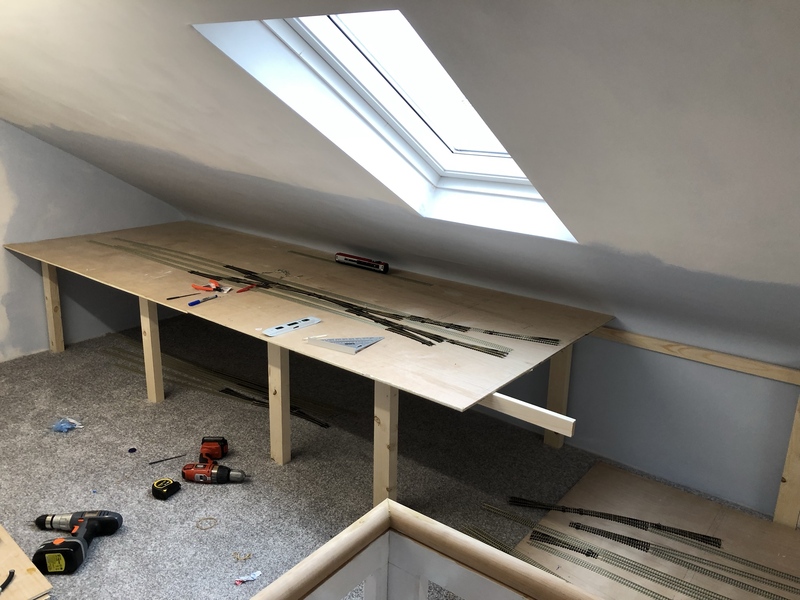 I didn't want a sitting-down layout so sacrificed a bit of width to get better height - it's just under 6ft and width is about 9ft with about 30ft for the length. The right-hand side of the room is where the storage roads are, as it has less height. All the scenic area and main station are on the left. Baseboards there have to clear the doors! A few things for you to ponder based on my experience. - The downlighters didn't produce enough light. I've recently replaced them with the latest LED striplights. These give very good light indeed, fit flush to the ceiling and are only 25mm thick - a consideration where you have limited roof height. - The windows on the right face west which causes a real problem with strong sunlight in the afternoon and evening so good blinds are needed. Don't know which way your windows face. - The sloping walls make it well nigh impossible to get a decent back scene, so I just painted mine sky blue. - It still gets hot up there in summer. It's the highest room in the house and hot air just rises up there. Excellent. I’ve had a look, but can’t find anything from your layout except for a few old posts from a Bolton layout you did/are doing? I’d love to take a look at that if you have a link? Hi Ade, lots of steel in there now. Starting to take shape and look like a proper room now. Should all be completed and plastered tomorrow. Unfortunately I’m back in work Thursday so won’t be able to start until at least next Tuesday! I’ve just had a look and a little follow of your layout there. Looks like it’s going to be quite the layout. Dont worry about hogging the topic. Anything and anywhere I can learn things from, I’m more than happy to see. That’s very helpful, thanks. I also struggle with the head height, so have got some strip lights being put in as I was unsure as to how much coverage into the corners downlights would cover and dangly lights would just get in the way. My plan was also to paint the walls sky blue as, like you mention, it’s going to be very difficult to get a decent backscene in, not without sacrificing a huge amount of width. Only issue would be lack of vertical profile along the walls, as I’ll have cupboards both sides, so can’t go below them. Due to the restrictions on my ‘lease’, I couldn’t put any windows in the front, so both are at the rear of the house, which is south facing. I feel that this will be quite handy in winter, but summer it could get pretty warm. I’ll definitely be investing in some blinds. Do you have a layout thread I could have a follow of? Sounds like you’re doing something very similar. There should be more to come after tomorrow when the builders have moved out. 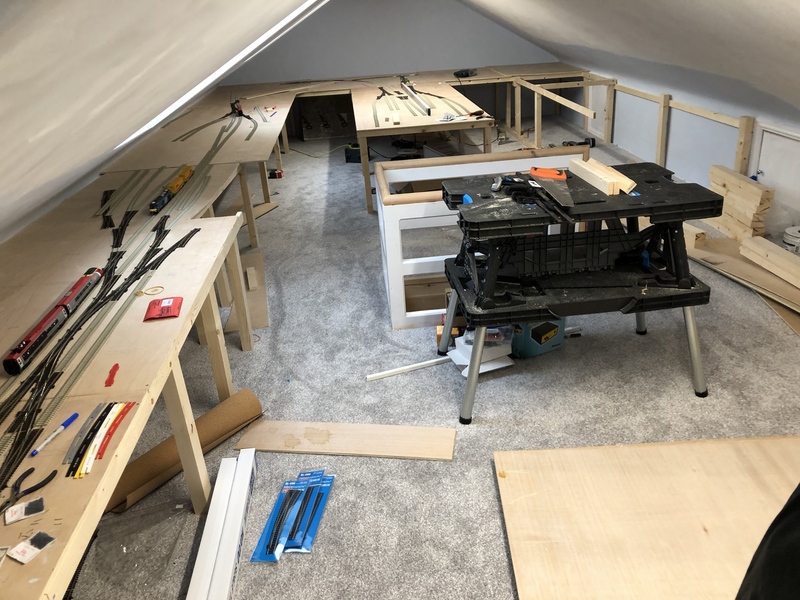 Also slight change of layout plan- swmbo has had a look up in the loft and suggested how I might use the space more ‘efficiently’ which allows me to have the kids up there with me so I can continue modelling. The space on the left will now be a little more compressed as a tv will be put on the wall above the layout. A sofa next to the hatch should create a decent little area for the kids to play with their toys while I play with mine. Updated plan to follow with the pictures of the completed loft. As always, hints, tips and constructive criticism appreciated. Hi there - I don't have a layout thread as such but I may start one. I've got lots of photos of the progress so could easily start one and drip feed in the progress. As you can see from my photo of the completed conversion, the downlighters create pools of light which means the light is very uneven. Also I have cupboards for storage on the left, so the baseboards have to clear that to allow doors to open. I had to be careful where Tortoise point motors were fitted to ensure they didn't obstruct the doors. A couple of places had to have Peco solenoids but fortunately these are in the loco yard rather than in critical main line locations. As far as blinds are concerned, I made the mistake of having Velux blinds that were designed for bedrooms to cut out all sunlight. That meant on sunny days, with the blinds drawn, I was totally in the dark. So these were replaced by venetian ones, but these have to be angled correctly. The problem is my storage yards are on that side and you have to be careful that your rolling stock doesn't get bleached. I have a few Hornby Pullmans whose cream is now white on one side. Your windows face south so you may find you need the blinds drawn most of the time. 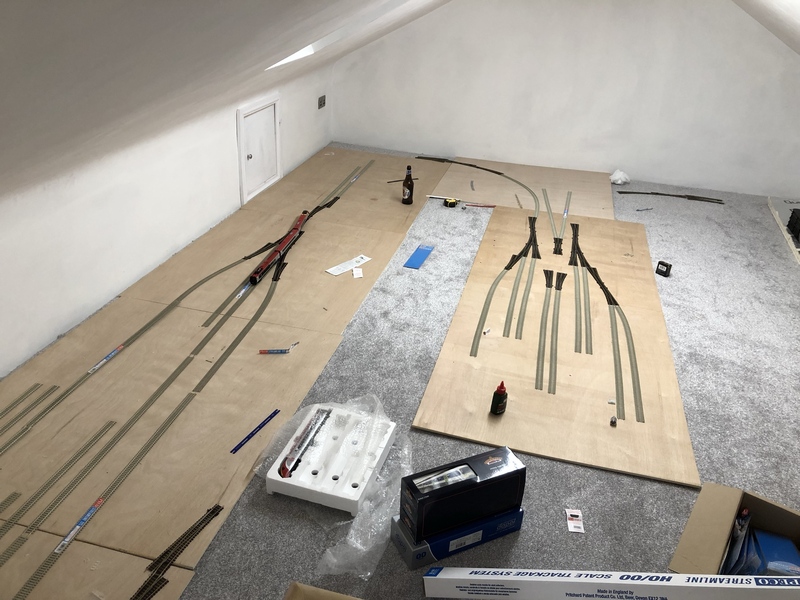 It can still get quite hot up there so you need to take care when laying track, ie that you do so when it's reasonably warm and ensure expansion gaps are used. I've only had to relay one stretch of branch line track so far! We were fortunate in having a cupboard at the end of the landing so were able to sacrifice that to provide a staircase at the end of the room. So not just content with Shed and Garage envy, I now have to contend with Lofts too! Great size to work with and the track plan looks awesome - with all that space it's possible to ease the curves slightly too. Been a while since my last post. Needless to say I have been squirrelling away when I can get a bit of spare time off work and the kids aren’t about. The conversion finished, I painted and made a start on the baseboards. First I laid out the boards on the floor so I could ‘dry fit’ the track. This was so I could figure out where the points (more specifically the point servos) would go, so I don’t accidentally put a supporting beam exactly where I need a servo. As my old lecturers used to say- a picture paints 1,000 words, so be prepared now for a several thousand word essay. So it’s all going pretty well. My only issue so far is the corners. Having laid the baseboards, I’ve found I now can’t quite reach into the corners. 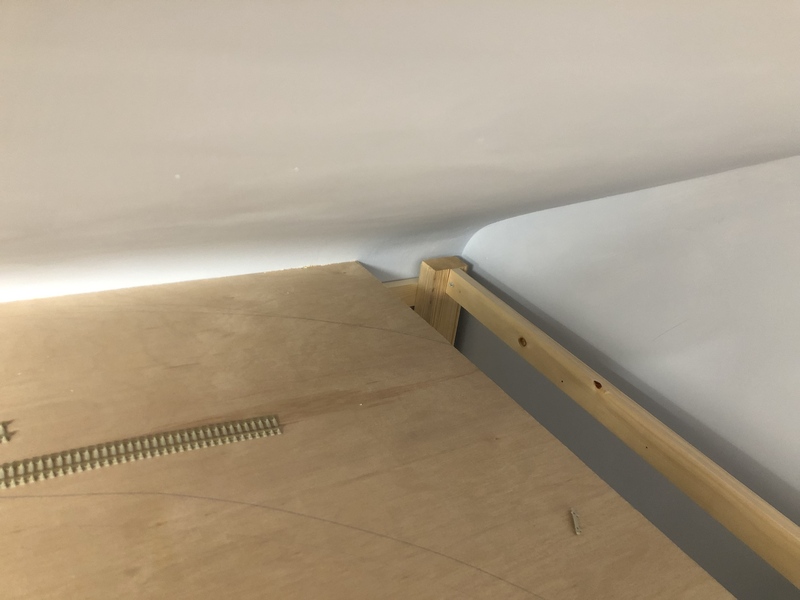 I’ve beefed up the support underneath, so I’m able to lie across the baseboards if necessary, but that’s not so much an option once I start getting scenery down. Does anyone have any suggestions on easy access to hard to reach areas? I don’t expect to have any track in those areas, but it’s be handy to be able to do maintenance. A picture below shows the arc of my absolute reach limit. It’s only a small amount, but I’d still like to be able to get to all parts. As always. Thanks for looking in and any suggestions, constructive criticisms or tips are always welcome. I’ve seen traps done in the corners that lift out or hinge down/up and you crawl underneath to access them. but with your sloped ceiling being so close I don’t think it’s an option. Only thing I can think of is a lift out section but the senics on top would need profiling to miss the slope on getting it out. Then a method of actually getting to it and accessing hidden handles (screw in maybe) to pull it out for access. Not easy my 10 pennies worth probably better options out there!